In the report, ArcView found that the legal marijuana market grew 74% from $1.5 billion in 2013 to $2.7 billion in 2014. That's incredible growth driven almost entirely by the passing of new state-level marijuana laws. This is the definitive market report covering the economic side of this remarkable moment in history. So much happened in 2014 that the report is has over 340 pages of beautiful charts, graphs and other insightful information that The ArcView Group made very easy and fun to read and digest. The inside scoop on the unique market dynamics playing out in each of the state markets (plus Washington, DC). Predictions on the next states to pass new cannabis laws. Review of the top 13 trends driving the cannabis industry today and in the near future. Retail and wholesale sales estimates nationally and in each state for 2014, projections for 2015 and 2016, and a 5-year forecast. Ranking of each state in terms of consumer access, opportunities for new entrants, market growth, sales, and other key market statistics. Market trend information on ancillary products and services categories, such as insurance, product testing, software development, information data services, tourism, and more. Profiles of 22 leading companies in the cannabis industry, featuring company overview, industry sector SWOT analysis, industry advice, and "The ArcView Bottom Line." A detailed timeline of important industry moments, from the founding of NORML in the 70's to the Founder's Fund investing in the industry in 2015. Access to an easy to reference matrix of the key regulatory elements that drive business decisions in each state, such as whether licenses are given out by a lottery or merit system, whether there is broad consumer access or limited consumer access, whether out-of-state investment is allowed or not, and many more key elements crucial to the decision to enter any given state market. 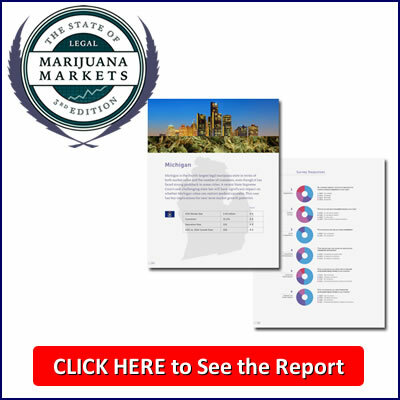 This report digs deep below the surface to give you insider analysis on each of the key trends along with high-level analysis of each state's economic and regulatory microclimate and interviews with the top players. If you plan to make any expensive decisions regarding the legal cannabis industry this year, you deserve to have access to the most actionable and detailed data and analysis by the top insiders in the industry. For the cost of one or two hours of a top experts time, you get the benefit of hundreds of their hours and original data all distilled down into a primer for making economic history. Order your copy today to get digital access now and the full 340 page full-color hardcover collector's edition in a few weeks. Remember, if you use the discount code "SDW100" you will receive $100 off and StoptheDrugWar.org will receive a $75 donation. P.S. ArcView's other division, The ArcView Investor Network, hosts members-only "Arc Tank" events in cities around the country. To get more info and to see if you qualify to join the ArcView Investor Network, please inquire here.